Back in the mid-1970s, Sumner and Muriel Parker lived on Route 4 in Northwood and ran a small shop selling NH souvenirs, moccasins, and soft-serve ice cream, mostly seasonal, to folks who came to visit the area’s lakes. They added a few tables with antiques. 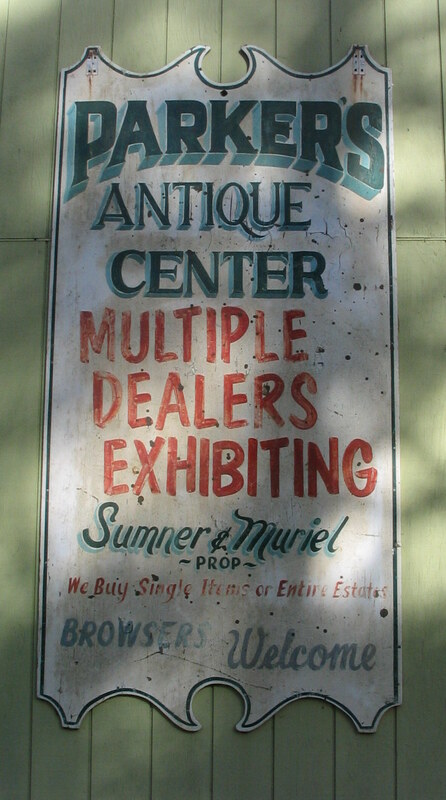 Within a short time, other dealers asked if the Parkers would let them have a table or two to sell their antiques, and by 1976, the ice cream and moccasins went, and the shop officially became Parker’s Antiques. It was the first group shop in the state, if not the country. With the Parkers’ success, other antiques shops (both single owner and group) sprouted up along Route 4 in the towns of Northwood, Epsom, and Chichester. The route became known as “Antique Alley” with Parker’s as “The Cornerstone”. In the heyday of antiques – 1980s and ‘90s – buyers from all over the country and world would come to NH and Antique Alley and its nearly 50 shops to bring treasures back home, or to resell. New Hampshire has had a strong reputation for being a place to find antiques. In the 1960s and ‘70s, George Michael ran auctions in Dover, NH on Saturdays. Many consignors from southern New England and Maine would bring their family “stuff” to sell at auction on their way up to their camps in the Lakes Region. There was a multitude of “old stuff” that was not wanted, so they’d drop it off before the auction and pick up cash on their way home! Lucky for us, NH dealers and lovers of “old stuff” were there to buy it and keep it in NH. This inventory fueled the sales of NH antiques for decades, and to a lesser extent today, with so much of it gone, although there is still plenty around in the form of mega-collections in dealer’s homes – stuff that comes out slowly but surely. Parker’s Antiques remained so until 1988 when it was purchased by Caroline French and her husband Gordon Millar, who were dealers at Parker’s. Caroline’s mother, Sarah French, ran the “French’s Antiques Show” at the old Highway Hotel in Concord (where the Hannaford Market is at Fort Eddy Plaza). French’s Antiques had its fine reputation for antiques and that family heritage continued with Caroline bringing it to the shop. Caroline added the French name to Parker’s, becoming Parker-French Antique Center. In 1988, Richard Bojko and John Mullen purchased Parker-French. Richard and John were dealers in the shop. They kept the name as is because it had developed a great reputation, rather than adding more names “making it sound like a law firm,” quipped Richard. One of the shops springing up on Route 4 in the mid 1980s was Hayloft Antique Center located next door to Parker-French. George and Marie Hay, original owners, sold it to Pat and Lou Guevin, who sold it to Warren Hart. When it came up for sale again in 2005, Richard Bojko and John Mullen purchased it and renamed it Parker-French West Antique Center. Antiquers have always enjoyed coming to two shops located next to each other as a destination, with plenty to see in nearly 300 dealer spaces, and Richard and John wanted to keep that tradition which is maintained to this day.